The dual CAN Interfaces use the TJA1040 CAN driver (IC4 for CAN1 and IC5 for CAN2) and termination resistors (R10 and R16 for CAN1 and R17 and R18 for CAN2) on the MCB2100 board. The driver settings may be changed by the configuration jumpers. 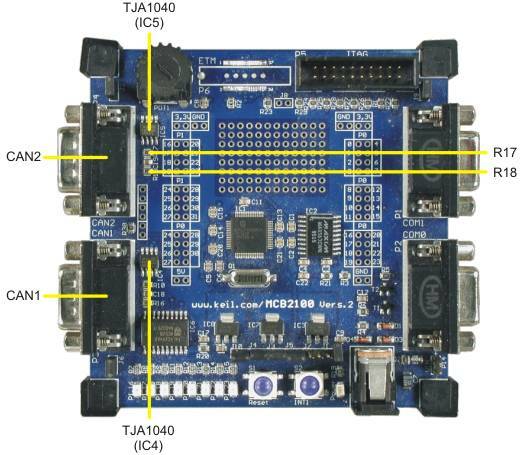 The CAN1 and CAN2 DB9 connectors are wired identically (Pin 2 provides the CANL signal and Pin 7 provides the CANH signal) and each is connected to a TJA1040 CAN driver IC. CAN termination resistors make it easy to connect the MCB2100 board to your CAN network but they are not always required. When connecting the MCB2100 Board to a CAN network, you may need to remove the termination resistors.